The good news is that all 103 passengers and crew survived the crash of an Aeromexico flight that came down shortly after take-off from Gaudalupe. 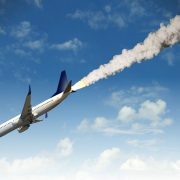 That really should be all there is to say, were it not for the fact that passengers who escaped the aircraft took pictures of the crash and posted them online, even before the emergency services arrived. That is how fast news travels today, via social media. Anyone with a mobile phone can be an on-the-spot reporter. For businesses considering their crisis management plans that knowledge should be an immediate jolt to review such plans and be prepared for immediate response. Even if only to prepare holding statements, to be used until facts can be ascertained. How many businesses with, any sort of public profile, can say they are prepared for such immediate response? Waiting to have all the facts at hand is becoming a luxury that can make a public facing business look slow and disengaged. Immediate review of public response protocols and standby statements should be, if not already done, an urgent priority. It may be impossible to predict every eventuality but it is possible to be ready for the unexpected. RMK+A has long experience in managing media and public response to significant situations and in providing businesses with the tools to react, in a reputation sensitive manner. In the last few weeks the Federal Government has faced community backlash to another of their ‘big-data’ plans. This time the brilliant idea to create My Health Record. A central repository for all the health data any health practitioner, and the government agency, may have collected on any individual. On the surface, the idea of providing health professionals with a central point of information on patients sounds like a good idea, for the health professional, arguably even for the patient, should they find themselves dealing with a new doctor, in emergency situations, or not able to keep track of medical treatments. But, the flaw in the plan was almost immediately obvious to anyone who had even the slightest concern about the security of a central database of such personal information. A concern not made any better by the initial intention to allow access to that information by law enforcement agencies, without a Court Order. The ensuing media hubbub and resulting public concern about the scheme was, to all but the Minister’s office and the Health Department, entirely predictable. In the resulting back-down, by Minister Hunt on July 31, agreeing to amend the enacting legislation to require Court Order for any access by law enforcement or government agencies, and to extend the three month opt-out period. No matter how much spin attached, it was an embarrassing admission of a failed initial communication and a lack of understanding of the public mood. It may appear odd that millions of people are willing to volunteer personal information on social media platforms but are concerned about a health record site. However, the fundamental difference is in, at least the appearance of, choice. Even then, Facebook has encountered enormous push-back when it became clear that they were commercialising user information without users’ knowledge. Public trust of big-government is, increasingly and around the world, at an extremely low level. 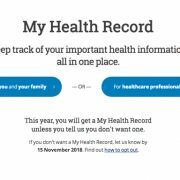 For the Federal Government to foist a centralised health database on all Australians, with limited public engagement and no understanding of the likely resistance, only feeds public perception of a cavalier attitude to individual privacy. The endless litany of database breaches, from airlines, to tax offices, to banks to … well you name it, only feeds a deep-seated scepticism. As one online security expert put it – ‘there are only two types of database, those that have been hacked and those that don’t know they’ve been hacked’. It is no surprise that more than 10% of eligible patients have opted out of My Health Record. A number that runs into the millions and that continues to grow. The lesson is clear. In an increasingly interconnected world, the issue of data-privacy is coming to the fore, perhaps a bit too late, but the public concern is now live. Failure to recognise that fact and to communicate effectively will result in the sort of push-back the Health Department and its Minister have endured.